At the end of 2012, VEI engaged in a WOP with Mombasa Water Supply and Sanitation Company Ltd. (MOWASSCO). The main objective of the partnership was to improve water supply services in Mombasa, Kenya. 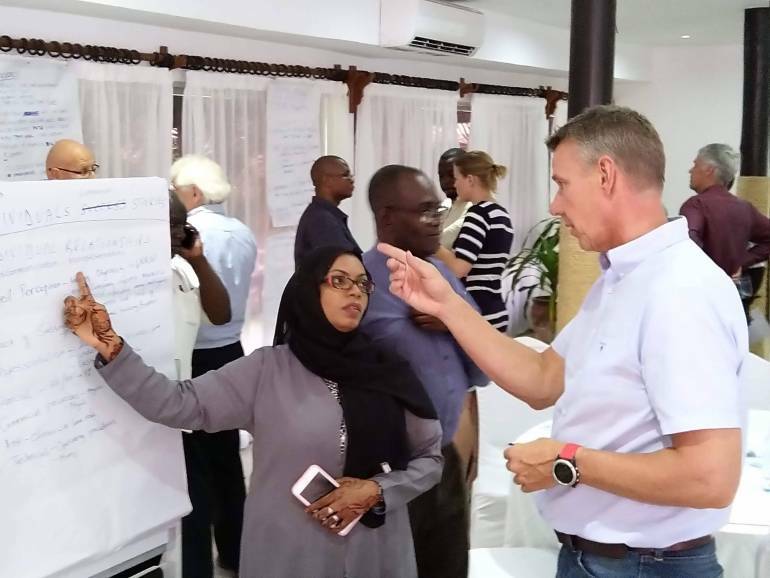 As a final opportunity of the partners to embrace each other, a two-day wo seminar – facilitated by Prof. Dr. Herman Wittockx – was held on November 15 and 16, 2018, at the Voyager Beach Resort in Nyali, Mombasa. The aim was to exchange views on successes and lessons learned during the partner period in an open discussion among VEI and MOWASSCO’s management team and business unit managers. Although the partnership did not reach all its of goals as of yet, MOWASSCO’s management has the confidence that – thanks to the assistance of VEI over the past six years – they have found the right track to continue their endeavors to enhance public water supply services benefiting the population of Mombasa. Public water supply in Mombasa faces huge challenges, such as dwindling water resources made available for distribution in the city and main port of Kenya. The construction of the Mwache Dam and associated water supply treatment plant should eventually bring respite to this unfortunate situation. Another headache of MOWASSCO is the fact that not all the water that is being distributed in Mombasa, reaches the consumers, or is being paid for. The level of non-revenue water (NRW) in Mombasa is about 50%, which seriously affects the ability of MOWASSCO to meet its financially obligations. Over a period of six years, VEI has been cooperating on a peer-to-peer (or operator-to-operator) basis with MOWASSCO. Reduction of the level of NRW has been one of the main targets of the cooperation. A master plan for water supply in Mombasa with a 2035 horizon was developed based on the establishment of district metered areas (DMAs) and is currently being implemented with loans provided by The World Bank. As part of the WOP, the concept of DMAs was piloted in six locations, and considered an effective way of controlling and reducing NRW, especially if technical and commercial teams operate conjointly. A team of 30 staff members were coached and trained on both technical and commercial skills. Team building and cooperation is crucial for success. The WOP has facilitated sessions of MOWASSCO’s board of directors (BOD) and corporate management team (CMT) in support of a management turnaround and culture change at MOWASSCO. The experience is that change happens faster when people participate in the change process. This means changing with people and not from – i.e. imposed on – people.